We need to elect more Democrats in South Carolina – especially in Horry County! Most Horry County residents are hard-working citizens who care about their families and their communities. HCDP is determined to help elect representatives who will fight for their values: access to affordable healthcare, protection of voting rights, equal rights, women’s rights, jobs that pay livable wages, and clean air and water for our children and future generations. There are many ways to serve in public office. Below are links to pages with lists of Elected and Appointed positions, including Boards and Commissions. Most local elections are non-partisan, but they are no less important to Democratic voters. 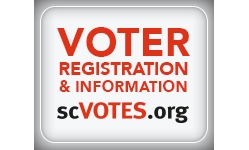 HCDP encourages citizens to closely follow city and town elections to learn about candidates’ views and past records, in order to make an informed choice on Election Day. Serving on local Boards, Committees and Commissions is an excellent way to gain valuable experience, build a network, learn more about the community, and have a direct impact on a variety of local issues affecting daily life. For example, citizen volunteers in Horry County help guide decisions related to planning & zoning, parks & recreation, public libraries, museums & gardens, solid waste & stormwater management, and much more. These are Appointed Positions, and often it is a competitive process. For many individuals, this can be a first step towards eventually running for office.